As for OnePlus 5 and OnePlus 5T, I had the opportunity to collaborate as a photographer with the company OnePlus for the launch of the new device. My role was also as a beta tester for the new OnePlus 6, with a prototype that was sent to me a couple of months ago, before the launch of the definitive device. In this period I had to take pictures (which were published both on the official page of the company and on Instagram) and give feedback to the OnePlus team regarding the development of the camera. OnePlus, for those who do not know it, is a relatively young Chinese company. It was born only 4 years ago but has been able to be known in this short time with smartphones build in excellent quality and with a different online marketing strategy. The price of OnePlus devices has also always been very competitive despite using the best hardware available. The first two devices OnePlus One and OnePlus 2 could only be purchased with an invitation. Then, from OnePlus 3, the sale opened regularly online on the company store. With OnePlus 6, the Chinese company goes one step further because the device is on sale both on the OnePlus company page and on Amazon. From the “Flagship Killer” motto, the company has been able to build a very well-established fan base, a community that revolves around this brand and that in a sense, reminds me of the sense of community and belonging that was there for Apple users in the period of the 90s / early 2000s, to be understood before the milestone change of the iPhone’s arrival. Let’s say that buying a OnePlus smartphone means putting in your pocket the best that is currently available for the technology at the best price on the market. With OnePlus 6, the company changed the main construction material and now it’s using glass. This is a current trend used by other companies such as Apple for its iPhone X, Huawei with the new P20 and Samsung on the S9 series. The glass certainly confers a character of elegance to the new device, even if on the other hand it has the disadvantage of leaving the fingerprints much more visible, and probably being more fragile in the event of a fall. It must also be said that the glass construction brought a slight increase in weight from the OnePlus 5T to the OnePlus 6, we went in fact from 167 grams of OnePlus 5T to 177 of OnePlus 6. In any case, the glass and the slight extra weight give the device a great feeling of a premium product. Another change from the past has been the move of the slider for the ring, vibration and silent modes on the right side of the device. The clicks of the slider seem to me now more precise than the previous models. OnePlus 6 is available in the finishes of Mirror Black/ Midnight Black/ Silk White (available from June). I would like to spend a couple of words on the screen of the OnePlus 6. The company has decided to adopt the solution with the notch. In this way, the front of the device is almost exclusively composed of an AMOLED screen except for the black notch area where is located the speaker, the proximity sensor and the front camera. Remember that those who do not like this solution can hide the notch from the preferences thus creating a uniform black band in the upper part (this is an option that you can find also on the Huawei devices). Thanks to the use of the notch, the screen has now become 6.28 “in size! Comparing the OnePlus 6 close to the previous OnePlus 5t, it seems to me that now, with the same color profile, the screen is slightly warmer. I want to spend some words for the edges of the screen: the rounded edges along the four sides, with a wider radius of edging in the upper corners, gives elegance to the device. I also remember that if you want to fully use the whole screen, now you can also completely hide the traditional Android navigation icons and use the new gesture navigation: with a swipe from the center you go back to the home, with a swipe-and-hold from the center you access the open applications and then a swipe from the left or right borders is equivalent to the back button. Last mention of the fact that thanks to the Oxygen OS software, you can decide in the system settings, App by App, whether to force full use of the whole screen or let the behavior be decided by the application manufacturer. Looking at the camera’s technical specifications, you can see differences from previous models. First of all, there was the addition, by many requests, of the optical stabilizer. Furthermore, the main sensor has become slightly larger. The secondary sensor on OnePlus 6 is working together with the principal one to generate the correct depth mask for the portrait mode. 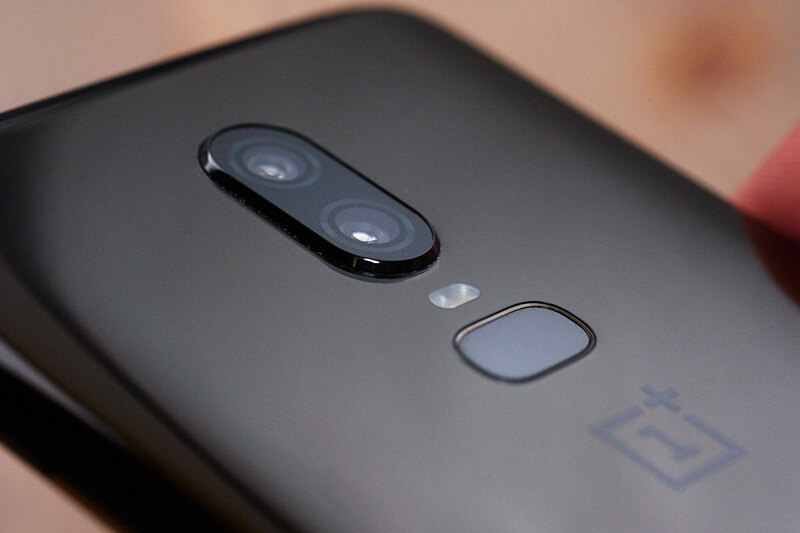 Therefore, the second sensor it’s no longer considered an “auxiliary” sensor for the night mode, as was the case with OnePlus 5T where the pixel binning technique was used. The Photo mode is the automatic “point and shoot” mode. In this mode, exposure and white balance are automatically adjusted. I also recommend keeping the automatic HDR on, in order to allow the device to optimize the shadows and highlights in high-contrast situations. As with previous smartphones, by clicking and holding in the point you are interested in exposing you can lock the exposure and then later you can raise or lower the exposure with the classic sun icon. I also remind you that the Photo mode is the one that is activated by double-clicking quickly on the phone’s click button. In the portrait mode, the device uses the two lenses to build a mask around the subject and thus create a blur to simulate depth of field. This mode was first introduced on the OnePlus 5, confirmed on the OnePlus 5t but now with OnePlus 6, it sees a noun improvement. There are still problems occasionally in the correct build of the mask, but in general, the quality of the blur is more realistic and the bokeh is more pleasant. There are also some new bokeh effects, which allow you to apply a star, heart or round effect to the lights that appear in the blurry area. I must say that in my beta testing period this mode was not yet fully developed and so I could not get convincing photos that I could be happy to share. The Video mode gains, probably thanks to the power of the new Snapdragon 845, the 4K at 60 fps recording mode. In this way, the OnePlus 6 align itself with the other flagship products that offer this recording specs. Furthermore, that playback on the device is always absolutely fluid. I’m happy that OnePlus has finally adopted a small video editor: with it, we can cut out the video, choose the moment in which the slow-motion effect occurs, apply filters and even background sound effects. Regarding the playback on the computer, I recommend using the new VLC 3 which introduces significant improvements and allows you to play the movie correctly even in 4k at 60fps (but you should have an average good graphics card). The Slow Motion is one of the new features on the OnePlus 6 camera software. Now we have the possibility to record a movie in 1080p resolution at 240fps. We can also go as far as 480 fps at 720p resolution! The Pro mode allows all the users who want to go a little “beyond the automatic” to be able to manually adjust Iso, Color Temperature, Shutter Speed, and the distance of focus. In this mode, we can also save the files in .raw dng format which can then be edited with software such as Lightroom and Photoshop. What can be the applications of the manual Pro mode? One could be for example, with the use of a small tripod, to get some interesting night shots using a low ISO and long exposure times to minimize the noise. In Pro Mode, you can also, for example, take some pictures with light beams or moving subjects. Another example could be the way to fix the focus for subjects that we photograph from very close distance. The Time-Lapse mode stops, like the OnePlus 5t, at 720p and 1080p resolutions. So there have been no improvements or updates in this feature. Too bad, a Time-Lapse in 4K may have been an interesting feature to combine with 4K movies at 60fps. Even here there is no news and the mode does exactly what you expect even if the results in the past wasn’t so perfect in the blend of the different picture. In my opinion, the panorama shots with the iPhone are still the best for the quality. After using OnePlus 6 for two months and seeing continuous improvements, I can say that we are definitely a step beyond the overall quality of the photos compared to OnePlus 5 and 5T. I think that already with OnePlus 5 and 5T we were facing with an excellent implementation of the HDR algorithm (even compared to the Google Pixel 2). In fact, the results were always very natural and never too saturated as usually found on some other products. With OnePlus 6 you can see a further improvement in this department, with the lights and shadows that keep even more detail. But stop! There’s more! Now we can also see the HDR preview visible on the screen in real time! From my point of view, one of the Achilles’ heels in portrait mode on OnePlus 5t was the skin tone that was obtained in some situations of difficult lights such as backlighting or in the shadows. With OnePlus 6 the skin tone in the portrait mode is always very natural, with a very rich detail even in situations of strong light that invests the subject in full light. In short, a nice leap forward in quality compared to OnePlus 5T! The colors are always pleasing but not too oversaturated. I found the contrast of the OnePlus 6 to be a bit lower than the OnePlus 5T. As for the quality of low-light photos, this is the sector where OnePlus was expected to make an improvement. And I can immediately say that there was! The use (finally!) of an optical stabilizer allows to use slower shutter speed time. The company has also been able to optimize the camera software with a more accurate management of the ISO compared to previous models. In the next weeks I will pubblish on this blog a more in-depth comparison of low light photo vs the OnePlus 5T, so remember to turn on post notification for this blog! OnePlus 6, switch from previous models? The question that may arise is: it makes sense to move to a OnePlus 6 if I already own a OnePlus 5 or the 5T model? In my opinion, it may make sense to move from the models like the OnePlus 3 / 3t or the OnePlus 5 ’cause of the screen that has increased from 5.5″ to almost 6.3″ without having suffered an increase in the overall dimensions of the device. The transition from OnePlus 5t to OnePlus 6 instead I see less motivated. In any case, I took pictures of OnePlus 6 next to my OnePlus 5T (with the red Skin on the dbrand) so you can see that the dimensions are absolutely the same. Speaking of the new arrangement of the camera vertically and just above the fingerprint unlock sensor, it must be said that you have to pay attention to where to place your fingers when shooting: I noticed that sometimes, placing the hand too close in that area, I ended up photographing a part of my fingers. Regarding the speed of the device, it is true that in general, the experience of scrolling through the various menus and switching between the various applications is very fast and free from lag, but it must be said that I did not find this huge difference with the previous terminals such as the OnePlus 5t. This is because already the previous smartphones were very fast and the company is continuing to work hard to optimize the software with continuous updates. Speaking of the camera, as mentioned there has been a great improvement in the areas of the portrait mode and low light photographs. The fact remains that I would have preferred an implementation of the second sensor as on OnePlus 5, where the second lens was optically a longer focal length. Last, but not least, the glass construction is nice but is delicate: after one week with the final product (the months before I had a pre-production with an unremovable cover) used without any cover or protection, I can notice already some small scratches from small movement of the device on a rough surface. So I suggest you buy an original OnePlus cover or to use a dbrand skin. As for the OnePlus 5t review, I would like to end with a wishlist for the next device, that who knows if will be a OnePlus 6T or OnePlus 7. Previously I’ve asked for some things and some specs got realized as the glass construction, a better ISO management, and optical image stabilization. Bigger sensor, Huawei proof that sensor size like 1/1.78″ is possible on thin devices. Wider aperture: f/1.5 like on the Samsung S9 would be great for an extra boost in the low light photos. The return of a real 2x telephoto lens, with maybe a bit longer focal length like an 85mm equivalent. The opportunity to have a portrait mode with a longer focal length like on the Google Pixel 2 and iPhone X . Really appreciated this review. Very detailed and helpful. Can I ask though if the front facing camera on the OnePlus 6 supports Camear2 API to shoot in RAW/DNG? All the specifications of one plus is shown here, it’s really nice one, can you tell me more about asus zenfone 5z. Looking forward for such blog. I’d love to hear your thoughts about the Huawei P20 Pro cameras. is it really the best camera in a smartphone so far? Great job and great photos! Love the colors and can see that both your eyes and your hands are the ones of an experienced photographer. Being a photographer myself I mostly find the camera reviews completely lackluster of nice tones or interesting compositions to show what the camera can really do. I’ll make sure to have any possible color emerge from this great camera, as you can see from my previous ones taken from a humble Samsung A5 2017 (or also an old Zenfone 2 Laser). Ciao Matteo, thanks for your comment and observation! I fell in love with Fontana’s colours when my Mother gifted me a photo album of his, I’ve never turned back. Good luck with your future works! No mention of DXOMark score? or is it too low to mention? Great Review Alessandro ! I am looking for a smart phone with a good camera and performance as I love to take photos with my smartphone . By any chance , would you also do a review for Zenfone 5 / 5z series which I think their cameras are promising too . Thank you ! How about iso management? Is it still minimum at iso 100? Can it go lower? Would you make an advance review like the one in “oneplus 5t vs iphone x vs pixel 2 camera compare”? Thanks for the great review Alessandro Michelazzi.. I was using Nexus 6P earlier. It has stopped working now. I am torn between different choices. How does oneplus 6 camera compare with Nexus 6P espcially in lowlight scenarios? would this be a significant upgrade from Nexus6p in terms of camera performance? If yes then I can throw my nexus 6p away and order this. If not then I can get my Nexus 6P fixed and wait until the next pixel is released. Ciao Muthu, thanks for your comment. Well, I think that the OnePlus 6 will be a clear upgrade from the Nexus 6P device! Technologies, especially in the smartphones, evolve so quickly that even on the devices one year by the other we see great improvements, so for a device of two/three years ago, the improvement will be quite noticeable. About the chose between the Pixel and OnePlus is a fact of personal taste, they are both for sure great device, with OnePlus that has an advantage in the price lists. Great review, Alessandro, thank you. I’m really impressed by the photos of the report. Thanks !!!! !